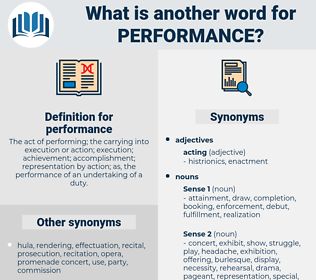 What is another word for performance? The act of performing; the carrying into execution or action; execution; achievement; accomplishment; representation by action; as, the performance of an undertaking of a duty. factors, Recalls, regions, features, facts, Duties, proposals, data, Scales, entitlements, lessons, tables, assess, tools, products, Its, yields. managers, Prices, inputs, Gains, reviews, Rewards, Killings, graduates, signals, yields. increased, noted, received, Carried, observing, Met. measured, Operated, increased, Delivered, assigned, developed, included, executed, Carried, established, Provided, identified, associated, required, Met, done, made. manifestations, efficiency, efficiencies, perform, yield, performing. manifestation, efficiency, perform, profitability, feat, performing, expression, competence, appearance, ensemble, prowess. disregard, neglect, failure, ineffectualness, unfulfillment, direction, inefficiency. endurance, suffering, quiescence, inactivity, inertia, rest, deliberation, quiet, cessation, suspension, nonperformance, Nonfulfillment, immobility, passion. The circus manager took the whole performance in with wide eyes. And then, let's gie a thought to just the matter of my performance. encore, extemporisation, last hurrah, illusion, programme, magic, trick, conjuration, program, legerdemain, musical performance, rendering, juggling, interpretation, swan song, dramatic performance, overachievement, magic trick, deception, Thaumaturgy, rendition, improvisation, underachievement, one-night stand, conjuring trick, juggle, dramatic production, extemporization. rendition, bit, pianism, song and dance, act, spectacular, rendering, representation, premiere, world premiere, benefit, concert, recital, routine, theatrical performance, turn, number, theatrical, histrionics, play reading. demonstration, presentment, presentation, accomplishment, achievement.